The finish line is torn down, the runners are resting their well-traveled feet, the medals are being worn around the necks of thousands all across New York City and probably the entire tri-state area. Race day still lingers on for more than a few hours--til the clock reaches midnight and November 8--but the ING New York City Marathon has its champions--Gebre Gebremariam and Edna Kiplagat--and its finishers, plus all the wannabes who'll be registering for lottery come tomorrow. But in the meantime, here's how some of those famous feet--from the celebrity runners--fared through New York's five boroughs to finish in Central Park. Al Roker. He may have doubted himself at one point, but Roker proved that anything's possible. He crossed the finish line with a time of 7:09:44. Meredith Vieira. She may have kept her marathon goals under wrap until days before the race--or at least to my ears, who only heard the news on Friday morning and is usually a pretty avid Today Show follower--but it wasn't so she could bow out gracefully from the competition. We'll see how Vieira manages tomorrow on The Today Show and how much she ribs Al for beating him. Just like Natalie Morales bested Hoda Kotb at last year's "Today Show Does a Triathlon," Vieira topped Roker with a 5:59:00. You go, girl! Jared Fogle. My husband doubted Subway Jared's ability to run the marathon at more than a walk or shuffle after catching a commercial with Meb and Jared running where Meb looked like he was barely moving and Jared was ready to keel over. But he was eating his words when I checked the marathon results to find that Jared finished in 5:13:28. Desiree Ficker. One would have expected Ficker toeing the line at Ironman Florida over the New York Marathon--or I did, recognizing her name as a triathlete before marathoner--but she returned to New York for the second year in a row. The only unfortunate part was she didn't have quite the day she was looking for, finishing with a 2:52:30, instead of the 2:39:30 she ran last year. Andy Baldwin. Here's a reality TV who can run--and fundraise for a cause (not knocking anyone else out there at all but merely pointing out Baldwin's efforts). Baldwin was spreading the word on Orange Laces, the ING Run for Something Better program that's trying to fight childhood obesity. And after running Chicago not even a month ago, he turned out a 3:31:48. Haile Gebrselassie. Even if you're not a marathoner you've probably heard of Haile, perhaps expecting a win and a world record, or at least a blistering half on the front or back ends. But the shocker came when he dropped out at mile 16--and then his announced his retirement. I guess you could say he was using the race as a way to say good-bye to the sport and turn a bum knee into a more eye-catching headline? Nah, the tears say it all...he wanted to go out with a better bang. Shalane Flanagan. Making her marathon debut and recovering from a slow 6:51 mile, she still managed to take second place, finishing just 20 seconds behind the winner with her 2:28:40. Stay tuned for more on Flanagan--I was trying to write it earlier but kept getting booted off the internet (had to be honest there). Meb Keflezighi. OK, so I became obsessed (only mildly, I swear) with this runner after reading his feature in Runner's World a few years back and was so elated over his 2009 marathon win, despite what all those Meb haters said about him not being a true American. But try as he might, he couldn't repeat today, finishing with 2:11:38 to take sixth place. If it counts for anything he did finish first among 35-year-olds. Ryan Sutter and Ethan Zohn. These two reality stars--Sutter from The Bachelorette and Zohn from Survivor--had a friendly battle going to see who could run faster to earn bragging rights and more money for their charities. Sutter took home the title with his 3:20:39, over Zohn's 4:16:20. But Zohn could argue that Sutter had an unfair advantage with some Rocky Mountain altitude training--and the fact that a year ago he couldn't compete because he was undergoing cancer treatments. Robin Quivers. Howard Stern's sidekick would have been a unlikely marathon runner before losing 80 pounds. But she went from barely able to walk to running 26.2 in 6:09:00. Amani Toomer. This former New York Giants football player became the first footballer to run the NYC Marathon in 17 years (who is the last NFL player to do so? I'm going to get my research guns out for that trivia bit). He trained for five months with Team Timex and Facebook pictures showed him starting dead last. But he passed a lot of feet to finish with a 4:13:45. Edison Pena. So we all know the story of the Chilean miner who trained roughly six miles a day (give or take) while trapped underground. His persistence paid off and he crossed the finish line in 5:40:51. Anthony Edwards. I always forget that this former ER star and Top Gun sidekick is a marathon runner. 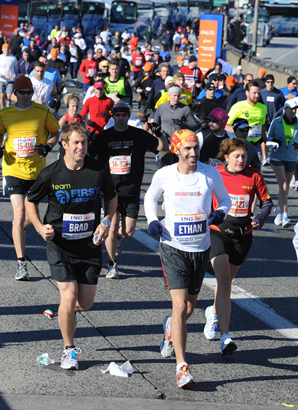 Edwards is almost becoming a regular on the marathon course, he ran last year and ran Chicago's race in 2003. This time around he ran a 4:04:45. For more results from today's race, check them out here at the ING New York City Marathon website. Photo grabbed from the ING New York City Marathon celebrity section, capturing Ethan Zohn starting his race alongside one of Sutter's First Descents teammates.